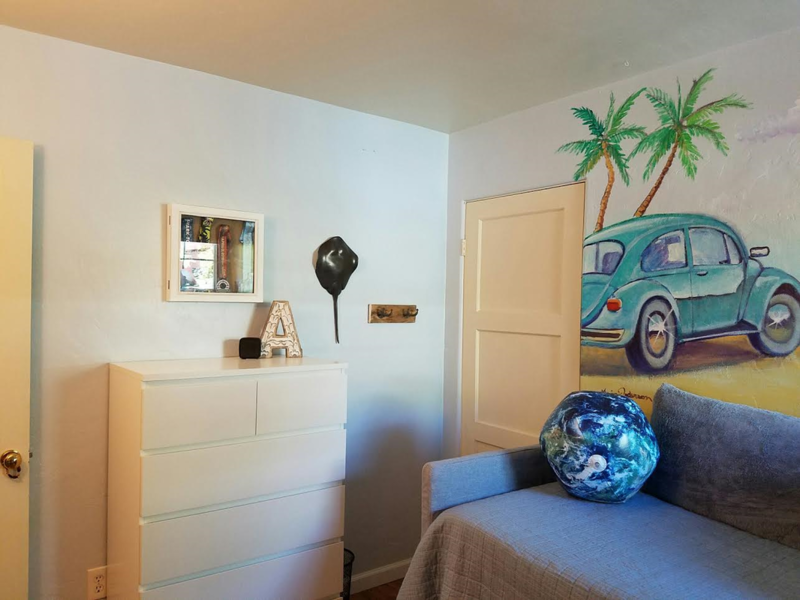 ​We love sharing the stories of the people we meet and why they were chosen for a room makeover from Cecily's Closet. This lovely teen, who we'll refer to as "A" to respect his privacy was born 18 years ago with a rare chromosomal abnormality. He also has Cerebral Palsy. Cerebral palsy (CP) is a disorder that affects muscle tone, movement, and motor skills (the ability to move in a coordinated and purposeful way). CP usually is caused by brain damage that happens before or during a baby's birth, or during the first 3 to 5 years of a child's life. ​As we can't share too much more about this child as he is in foster care, we just want to say that we are so grateful for the woman who took this child in and cared for him like her own. This child had a rough start in life and never even went to school until after his 15th birthday. Despite this, his teacher remarked that he always seems to have a proud look on his face when others hear this surprising fact! He survived a rough start in life but that is happily behind him now. 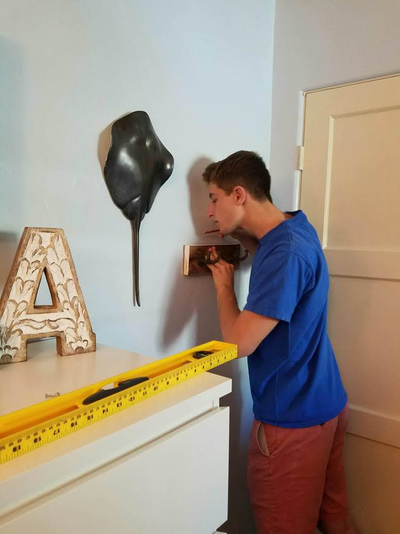 Thanks to love, support and the heart of a teacher, "A" is happy and thriving in his current life. We thought we couldn't do a better job of highlighting this woman's devotion, than sharing this poem by Paula J. Fox. ​and others just seem to hid. to create a work of art. and a belief that he can win! ​And we couldn't have said it better than that! We are sure that A and his supportive foster mother will enjoy this room for years to come! 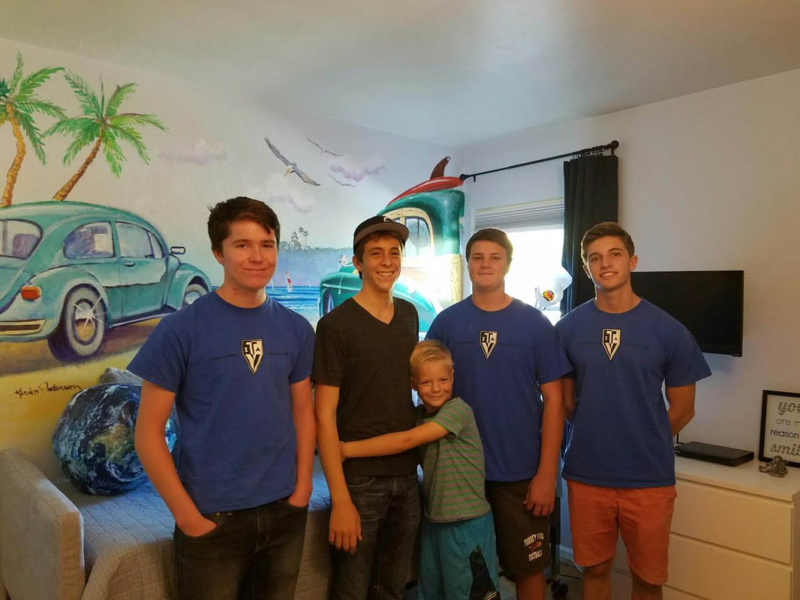 Thank you to Teen Volunteers in Action (TVIA) for helping us complete our latest room makeover for a teen in need. Thank you for once again making such an impact on a family in our community of San Diego! We are passionate about providing volunteer opportunities for youth in San Diego. These teens provide hands-on help to bring the room to life. From painting, to assembling furniture, making beds and interacting with the child in need, the support we receive from TVIA is well appreciated. 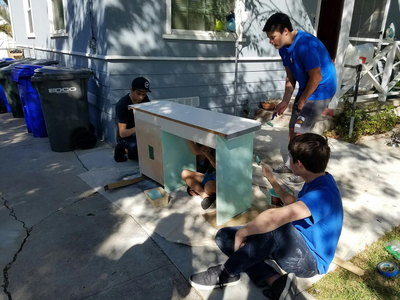 We are continually impressed with the manners, skills, talents and devotion these young volunteers bring to each and every one of our projects! 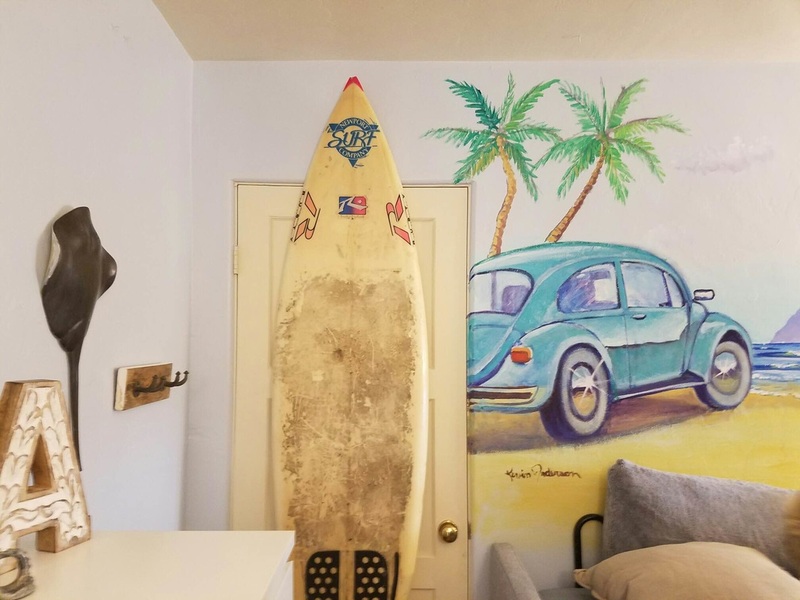 Mural Artist, Painter, Kevin Anderson is a local living icon in Cardiff-by-the-Sea, Encinitas, San Diego, California. 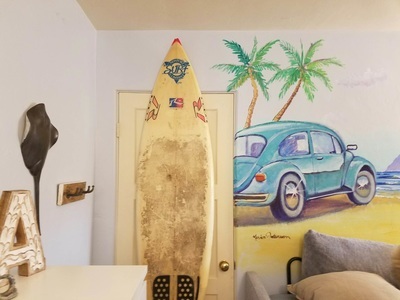 Encinitas's, perhaps most well known and prolific artist, his mural artwork & paintings are a familiar sight, to local residents, painted on buildings and walls all over Cardiff, Encinitas & San Diego, Ca. at large. Kevin Anderson is recognized as one of the single largest creator’s of public mural art in San Diego. ​To visit Kevin's Virtual Museum, click here. 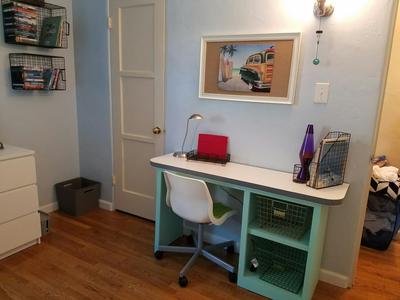 ​Cecily's Closet was lucky enough to partner with Teen Volunteers in Action (TVIA) on yet another magical room. 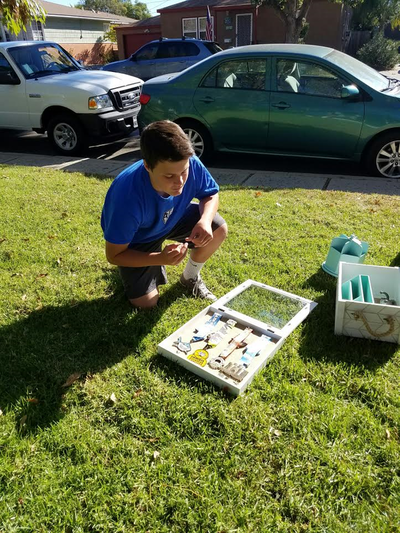 The teens were put straight to work painting a desk, creating a medal display case to display A's new slew of medals, and to hanging the various items around the room. Thank you TVIA for the smiles, hard-work and great day! 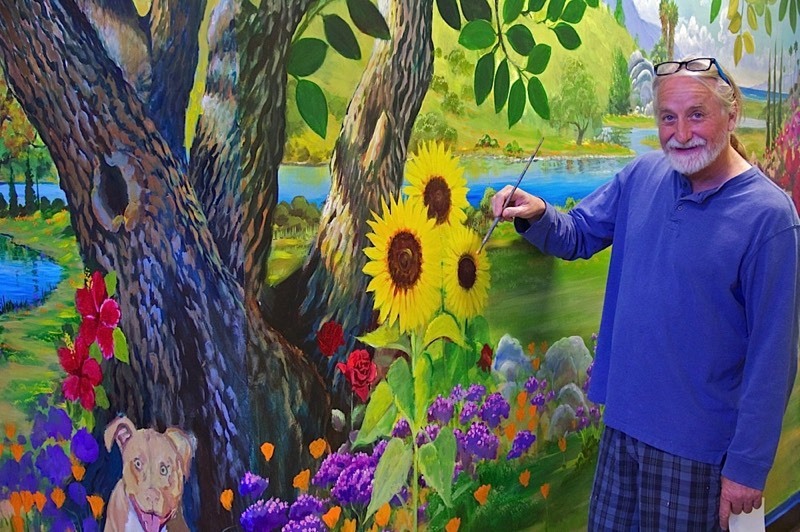 ​The feature wall was completed by our hometown hero, and local icon artist, Kevin Anderson. His work simply speaks for itself. 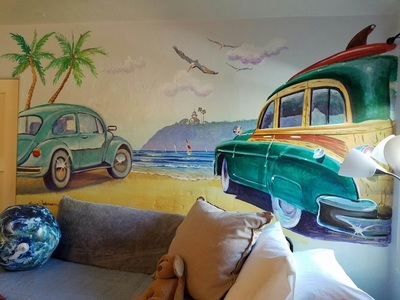 The room is so fun, welcoming and beacons you to the beach. Kevin has a heart of gold and you can't look at his work without smiling. Thank you to Jim Volcert for painting the room for us and our dynamic duo: Julie B. and Hunter for leading the install effort. And last but certainly not least, thank you to our regular handyman and Mr. Fix It, Bobby. Bobby is the calm during any storm and shows up (often unaware of the scope of work!) but always ready to conquer. We appreciate you. After the team left, "A" got up from his chair and started dancing in place and then darted for his room. He began to dance again. His caretaker refers to it as his "happy dance". He walked all around the room looking at the little vignettes and inspecting every little detail. And once in bed, he couldn't stop smiling, vocalizing happily, clapping and even laughing! We are happy to hear that he has been like this ever since and is loving showing pictures of HIS new room to his friends.